Sunday. I have a few hours free. I need to return some shirts I bought at Filene’s Basement. Apparently any shirts that fit my neck and arms are ridiculously large in the chest, billowing like sails. I need “modern” or “athletic” fit. That’s good, right? I grab an umbrella and head out into the Washington summer. I don’t have a lot of time, so I walk fast. A light breeze sweeps the heavy air across the streets. I get my refund and head on to the Corcoran, to catch the closing hours of their Modernism exhibit. The walk is wonderful – the skies darken, the temperature drops, and the wind blows. The heavens making a long, protracted sigh before the inevitable summer rain. The exhibit is $14, but worth it. A well-arranged collection of artifacts, assembled by themes and chronology. I’ve seen much of this before, but it provides a new perspective and is quite inspiring. But there’s plenty I haven’t seen – the costumes, the architectural models. There are many chairs. A complete kitchen from Bauhaus plans and designs. A car. The coat check man who insisted I check my umbrella can’t find it – but I can. And it’s a good thing, because now it’s raining. Curbs are overflowing and washing out. I take a long, leisurely stroll the many blocks back to the Leinberger place, listening to rain on my umbrella and music on my headphones. I’m there at 8. I drop off some of my CDs at the sign-in table, affix the printer label with my name I’m handed to my lapel, and walk in to the ballroom. The next few hours are a blur – a couple of bourbons, 6 glasses of water, a few bites of some extremely dry turkey. It seems like every woman I know has gone into education – two are special education teachers. Many are working in the Fairfax school system. Most of the guys are married with 2-5 kids. They all look the same, instantly recognizable. One guy is a federal agent. A lawyer. A consultant. Everyone seems happy. I talk to everyone I recognize and remember. It’s really nice to see some of these people. I wish I had more time to spend with them in a less-crowded environment. It’s a lot to take in all at once. I pass out some business cards and a few “try Rhapsody free” cards I have leftover from my last business trip. I hope it’s not too miserable an experience for those who do try it. I watch one fellow stagger drunkenly around before finally slumping outside in a chair with his beer. People are smoking, eyes avoiding each other. It’s late now, and the volume drops a bit. The DJ has gone home. Something changes and the secrets come bubbling up. The nostalgia gives way to a bit of regret in people’s eyes as they look around and wonder how it all ended up like this. If this is it. “Jack and Diane” plays in the background, and John Cougar sings “life goes on long after the thrill of living is gone”. I’m done. I walk out into the humid night, pausing briefly to admire a vanity license plate in the parking lot. I get in my rental car and instead of reversing directions and heading straight back to DC, I take Route 50 back into Fairfax. Things have changed so much – the streets are all incredibly wide and look like they were paved yesterday. Intersections have become convoluted and multi-arrowed signs proliferate like trees, sprouting the nine-armed symbol of chaos. There are far fewer actual trees, but the ones that remain are huge and ripe, filtering the streetlamps through the evening haze into tall, spiky towers of light. I marvel at the number of giant new office buildings, plunked down on sites that were once arcades, tiny shopping centers, or nothing. I pass the old library, still surrounded by trees – looks like it’s being renovated. Courthouse Plaza hasn’t changed, including its horrible signs. I glide through the enormous parking lot looking at the stores. I float silently down the road, passing an old elementary school, long since converted to a police station. Another elementary school has been re-branded and remodeled. I’ve been down this road dozens of times in my youth and probably as many in my dreams. It feels like I’m dreaming now as I roll through flashing yellow stoplights, alone. Fairfax High School fades into view on my left. It looks like they’re adding a second story, as pyramids of glass appear to be bursting through its top. The back entrance is taped off and locked, but the main parking lot is open. I attract the attention of a security guard car briefly as I loop through the parking lot. Great Oaks is still there. The sign is the same. The houses look the same. Fancier cars in the neighborhood. I’m sure these are very expensive places now. The wood retaining walls have all been rebuilt and the trees are enormous. My old house looks no different from the others. I’m back on the main street. The bowling alley is still a bowling alley. The woods behind it are now McMansions. The 7-11 is still there. I turn right and head up the hill. Former stands of trees are now partitions between giant subdivisions with names like “Pickett’s Rest” and “Woodhaven”. The Fairfax Ice Arena is still there, and still proudly open year-round. It’s now surrounded by brick industrial buildings – the kind that house gyms, offices, and other mysterious firms behind rolling metal doors. Fair City Mall remains as odd as ever – an enormous gym occupying what looks to be a whole wing. The other mall in front of it looks about the same, too – the stores change, but not much. The sprawling intersection is being resurfaced. I still can’t believe 3 giant shopping areas can continue to survive in the same place. Down 236 I go. Lots of churches. More houses. Pine Ridge Elementary is long closed. I sigh. It’s getting late and this trip down Memory Lane is bringing me down. I'm tired, so tired it all seems a bit unreal. Am I dreaming all of this right now? Even now, as I write this, it's so hard to keep straight. I've been back here before in my dreams. Were things this different already? I head back to Route 50, weaving through the sort of road that used to be everywhere here – hard to find, curvy. Dense with trees, houses all but hidden from the road. Half of the homes are now massive re-builds. The intersection of 50 and 495 is enormous and sprawling, dropping down 20 feet below street level before a glorious, graceful orbital curve throwing me back north into the night. All the exits on 495 have been renumbered, but I can still practically drive this by feel. I count the giant office towers as I head for the George Washington Parkway. I suppose I shouldn’t be surprised – if people can age and change, make foolish decisions and have great success, why can’t places? I whirr through the woods on the parkway. My headlights catch a fox in the median. He watches me drive by and scampers off into the woods. If my previous New Jersey hotel was business jail, the place I stay this time is the exact opposite. Doesn't really matter. It's still New Jersey, it's still a business trip, and it's still hard to enjoy. It's hard to eat healthy. It's hard to do anything other than go from office to hotel and back. And the airports really get you down after a while. These days "the dignity and elegance of travel by air" tends to mean watching people endure the stress test of pointless security and marveling at the absurdity of it all. The official government signs that misspell "Amended". The people who "forget" they have liquids in their bags. The filthy airport carpets we're all walking in our socks (or barefoot). I generally block out 90 minutes from airport arrival to board time. You never know how bad the lines will be. It usually doesn't matter, because these days, you're apt to get stuck waiting on the plane. On this trip, I got to the airport and found that my flight was delayed due to bad weather. In New Jersey. Where I was. So I took this photo, which pretty much sums it up. Note that it may be hard to see because the sun is shining so brightly. Other famous people born on July 16? I woke up this morning with blood pressure of 120/80. In good health. Looking forward to a mellow day - no presents or anything, and all the restaurants are closed, so probably dinner at home. I'd enjoy some sort of birthday party, but who has time to plan and deal with the hassle? I'm on a business trip in New Jersey. Some folks say "ooh, business trip! That's fun!". These people have never been on a business trip before. I am staying at the Courtyard Marriott (as requested by those responsible for the meeting and trip). It is Business Jail. I arrived last night at about 8:30 pm local time. I immediately hit the gym and ran 4 miles - in a hurry because I wanted to get some food before room service closed. This place is in the middle of an office park near the freeway, so there is nothing walkable. And I have no idea where to go on a Sunday night here if I cabbed it. I get back from the gym and call. Turns out the restaurant downstairs is closed Friday through Sunday! But they'll happily give me the number for Domino's Pizza, which is the only place that is open and delivers. Ugh. 45 minutes later (what happened to "30 or it's free?") my pizza arrives. After I tip the guy and he runs off I realize they didn't even include the drink I ordered. I walk through the silent halls, past the other cell doors to mine. I sit in the damp summer air and eat pizza while watching TV. I suppose I'm just spoiled. Unlike hotels I regularly stay at and enjoy, this place offers no lotion and the soap/water combination feels like it's leaving some sort of film on my skin. Breakfast rations are "the buffet" and "coffee". I sit with my back to the window, facing the door so I can see any up-and-comers who might try to shiv me for my USA Today. Later today I hope to hit the weights, maybe walk the yard. Supposedly all our meetings are being held here, and they're basically 9-5:30 Monday and Tuesday, then a morning flight back to SFO. A 4-day sentence in business jail. I have a feeling this isn't all that different from low-security prison! I had to get up early on Sunday morning and drive to SFO. I could do an entire post about the disaster that is airport security (on my last trip, I watched the security guards forcing people to leave bottled water behind, but had no problem letting a guy put an aerosol can of Lysol through the X-ray machine and then back in his bag), but that's probably unnecessary. I ended up in the last row of the plane. At least Continental Airlines has moved those forward from the bulkhead so they actually recline. I generally prefer the aisle seats, but this resulted in my shoulder getting bumped every time anyone walked by. Given that I was sitting next to the restrooms (a wondrous olfactory experience in itself), I got bumped a lot. I did have one small bonus - the middle seat of my row was empty, and it was the only empty seat on the plane. A nice treat. 6-hour flight. The movie? Firehouse Dog. I couldn't have watched it if I wanted to, as the sound system wasn't working, so the staff shut the movie down after 15 minutes. I don't mind the flying so much. I catch up on reading, do a little work, and listen to music. It's a bit like prison as well, but in a good way - some serious, uninterrupted solitude. Time for thinking, reflecting, napping. I write a lot of lyrics on planes. One more thing - On my last trip, I should note that the person behind me in the security line was none other than Eartha Kitt! Having lived in L.A. for so long, I'm a little jaded. But this is Catwoman, people! She should have her own security line, because a) she's awesome and b) who knows what eeevil devices she may be sporting? Anyhow, she is much shorter than you'd expect. And radiates star power. I don't know where she was going (probably some secret lair), but I guarantee it isn't any business jail. What I mean by that is we're halfway into 2007 and I've heard very little this year that's made me excited. In general, my enthusiasm for "albums" is waning - most new records feel like they were made to be shuffled or dumped in with a bunch of other music on a hard drive, rather than enjoyed like a 5-course meal. I have also come to realize that it's all Sonic Youth's fault. Thanks to "Daydream Nation". This album was recently reissued and Pitchfork Media gave it a perfect score. Of course they did, it epitomizes everything they think is cool. There's just one problem. It's not a very good record. It commits what I consider to be the musical cardinal sin: It's boring. Yeah, it's got "Teenage Riot". Great song. "Silver Rocket" is good. They're the first two tracks. But the rest of it? Eh. It quickly degenerates into a soggy, indistinguishable blob of chiming guitar strumming (is that a Roland Jazz Chorus amp?) and Thurston doing his sprechstimme even more tunelessly than normal. I defy you to listen to it all the way through and not reach for the skip button. "Kissability" is one of the weakest tracks Kim Gordon's ever done - formulaic in composition and "message". "Providence" is the sort of art experiment you'd expect college students to put on their debut ("ooh, let's make a fake phone message about a stoned guy and put it on top of our amps humming!"). Tracks like "The Sprawl" and "Eric's Trip" just seem to go on and on and on...Many of the songs are 7 minutes long or longer and you will feel every second of it. And there's a "Trilogy". I'm assuming it's an "ironic" Trilogy, but why can't they do it in 3 minutes? Brevity is the soul of wit, kids. I loved "Evol" and "Sister". I thought they were both better-sounding records and had more interesting songs. 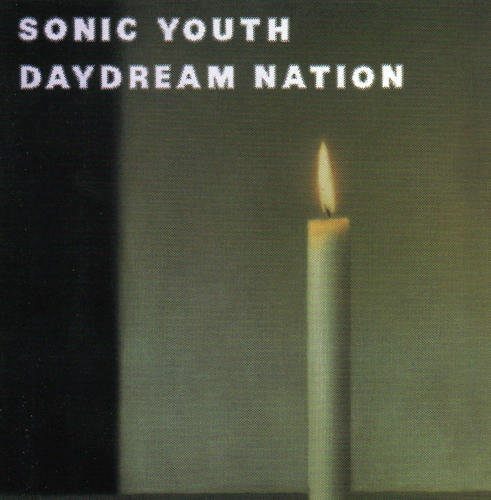 I have liked much of Sonic Youth's numerous other albums. 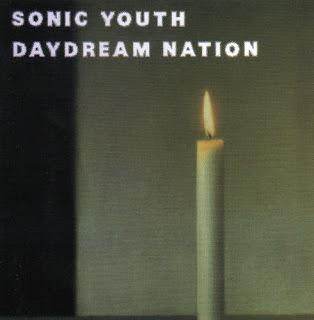 But "Daydream Nation" broke my heart. I listened to it over and over, trying to understand why everyone was going so crazy for it. I still don't "get it". And yet this is what much of modern indie rock music chooses as its template. Maybe I'm just getting old. Bah. I'll post soon about some records I've liked.